Red Bull KTM Factory Racing saw all three riders classify in the top thirteen of a sizzling and unpredictable Gran Premio Red Bull de España with Mika Kallio taking a updated version of the KTM RC16 to a season-best 10th position, Pol Espargaro less than two seconds behind and Bradley Smith notching a 2018 highest finish of 13th. KTM were also victorious in the Moto3 category with a full podium sweep and were present on the Moto2 rostrum with Miguel Oliveira. Almost 70,000 spectators cooked in early summer sunshine at the Circuito de Jerez – Angel Nieto for the fourth round of nineteen in the 2018 MotoGP contest. Track temperatures crept up to 45 degrees by the time of the 25 lap premier class race in the middle of the afternoon in southern Spain. In a dramatic affair that was lined with incident and accident, Mika Kallio took the updated spec of the KTM RC16 to a top ten ranking and just beat Pol Espargaro. The Spaniard had to defend his slot from a last corner attack from Bradley Smith as the duo defied rear grip issues to battle to the final moments. All three riders were within 21 seconds of race winner Marc Marquez. Red Bull KTM Factory Racing will remain in Spain with two busy days of testing slated for Monday and Tuesday. 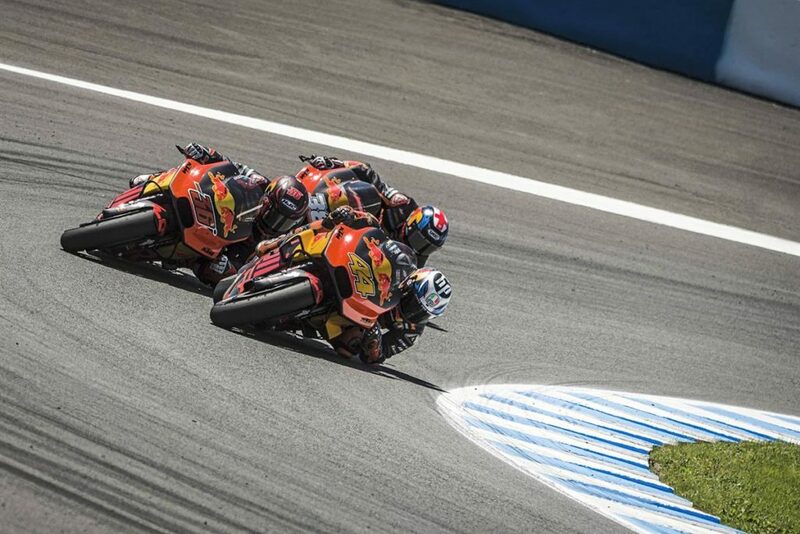 Both Red Bull KTM Ajo riders vied for the lead in Moto2 in the initial phases of the 22 laps with Miguel Oliveira and Brad Binder making very positive starts on ther KTM Moto2 bikes. The Portuguese threatened the rear wheel of eventual winner Lorenzo Baldassarri but couldn’t quite relegate the Italian while Binder had to ease his pace to finish 6th. Oliveira has now collected three podium finishes from the first four rounds and is third in the championship table. Moto3 was won by Philipp Öttl; the German took his Sudmetal Schedl GP Racing KTM RC250 GP to Grand Prix victory for the very first time after a close, final-lap dash with Marco Bezzecchi. The race was notable for two major ‘pile-ups’ that claimed a host of riders, including championship leader Jorge Martin. The chaos combined with Bezzecchi’s second podium finish of the season has elevated the Italian to the top of the standings. KTM machinery filled all top three positions with Marcos Ramirez in third. 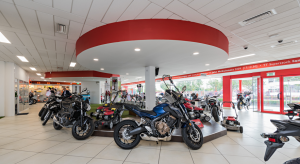 MotoGP moves north through Europe for round five at the historic setting of Le Mans for the Grand Prix de France in two weeks time.